Every day people are coming up with new ideas, building new masterpieces, and experiencing new stories! How can we share these ideas and experiences in a way that is beneficial to the most people? How can we effectively spread our ideas and innovations? The best way for your new idea, program, tool, system, or solution to spread is through the written word. The internet has made it possible for anyone to self-publish and share their ideas. There is an abundance of tools and resources that make this process simple and affordable. When you sit down to put your idea on paper there is a lot to consider. These considerations will range from developing the content, designing the book, formatting the text, technical issues, and selecting a publishing platform. These thoughts can easily become overwhelming. Through my own trial-and-error I have established the following four step system for self-publishing. These four steps will help to clear your mind, sharpen your focus, and serve as your guide through the process. Content is king. The most important part of publishing for your idea to spread is the content itself. Make sure you are clear on what you want to say and who you want to say it to. Know your message and your audience. Your message is what you are passionate about. This is what led to your idea in the first place. Your audience will be those individuals that serve to gain the most from your idea. The first step in writing is to organize your thoughts. Create an outline of your content and what you want to share. This will become your table of contents. The second step is to write the content for each of the sections or outline points. You do not want to sit down with the idea to just write as much as you can. Most will find that too difficult. Simply focus on writing a small section at a time. I like to use Google Docs for this as work can be recovered and accessed from any computer. Once you have completed writing the content, assemble and organize the sections, add photos and references, and update your table of contents. Review the completed work and make any necessary changes. You will see items that need to be changed, deleted, added, or re-organized. After you have reviewed the material have a third party review, proofread, and make notes on your document. After making any suggested changes, your manuscript is complete. For more on how to write, or for the non-writer I recommend, The Book in a Box Method: The New Way to Quickly and Easily Write Your Book (Even If You’re Not a Writer). At this stage you will have to decide how you will want your book to look. What size will it be? This will change the page count and book thickness. How will the pages be oriented? Landscape or portrait. This information is critical for the design of the book cover. In a separate document write your back cover copy. What do you want the back cover to say? What are the important selling points of your back? What problems does it solve and how? The cover is what you book will first be judged by, so make it count. For more information on good book design I recommend, Dan Poynter’s Self-Publishing Manual: How to Write, Print, and Sell Your Own Book. There are several options for cover design. You can design it yourself, you can use pre-made templates that the publishing platform offers, or you can have it created for you. I have tried, and do not recommend, the first two options. I have had great success with using a semi-professional to design my covers. I recommend, Fiverr (www.fiverr.com) for finding these designers. Just search, ‘book cover’ and you will receive a long list of results. Look through their work samples and find a style that you like. You can have a nice cover design for around $50. You will want the front, spine, and back cover. You will want them delivered in .pdf and .jpeg files. You will also want separate a separate file for each, front and back cover. Note: You can also use Fiverr to find an editor that will review and correct your manuscript. Will you want your final book to be digital only (e-book), print only, or both? This decision will be driven by how you choose to use the book and what your audience will accept. The best option usually is to make both available. There are several platforms for publishing in both formats. These platforms vary in cost (how much they take per digital sale, and how much they charge for printed copies). Research these to find what best meets your needs. Your book’s content will need to be properly formatted so that it can fit within the page sizes that you have selected, so that it will be readable on digital devices (ereaders, kindle, ipad, etc. ), and so that the table of contents will be clickable for navigation. If you are computer savvy you can do this. However, do not spend your time trying to figure this out (see how my first try ended up). I use Fiverr for formatting. Pricing is affordable and based on the number of pages. We are now on the final stretch. Your manuscript is complete, your book cover has been designed, and you have selected a format for your book. Now you have to finalize your decision on which publishing platform you are going with (see above options in ‘Format’). Each platform offers step-by-step instructions for completing your book. For ease of use, sales, availability and pricing I recommend using Amazon. You will have to establish an account on Amazon KDP for your digital version, and an account on Amazon CreateSpace for the print version. Simply upload the prompted files (cover, manuscript, etc. ), insert the requested information, set your price and publish. Your innovation and idea is now published and available for all. The only thing left to do is share. Tell the world about your idea. Show them what you have created. Utilize your social media channels to spread the availability of your printed work. Order print copies (CreateSpace makes this easy and affordable) to hand out and distribute. Teach a class or give a presentation on its content. Tell what you know! We are only better as we work and build together. If you need assistance or have any questions related to this process, I am available for contact at hagiograph.you@gmail.com. Bright Orange for the Shroud was my first introduction to Travis McGee. McGee spends his time on a boat he won in a poker tournament, Busted Flush. In MacDonald’s tales, McGee helps people take back what they lost. He cons the cons, keeping 50% of what is recovered. McGee moors his house boat in Ft. Lauderdale’s, Bahia Mar yacht basin. Florida residents will appreciate the realistic sights, sounds, places, and experiences. Published throughout the 50’s and 60’s the writing offers an interesting perspective to the historical and political background of the State, offered in MacDonald’s narratives. Though MacDonald is,at times, verbose his prose and turns-of-phrase are unparalleled. His writing sets in you like a hooked fish and you have to read to the bitter end! I started writing 8 years ago. I was writing in the non-fiction space, for an audience of firefighters, fire inspectors, and the fire protection industry. I have written nearly 500 blog posts and articles for this audience. I have published 2 non-fiction titles on the fire service, 1 self-help book, and edited and published a collection on finance and success . Why would I suddenly turn to fiction? More specifically, why would I write this book, The Unaccounted Four? I have been told by friends, counselors, and even a psychic, that I need a hobby. The two activities I most enjoy are reading and writing. I find the writing and publishing process to be wholly enjoyable, and a mental and emotional outlet. I wanted to know if if could write something that would be capable of transporting a reader to another world, for a brief period. I wanted to exercise the art of writing characters, places, and scenes, so clearly that they could be seen by anyone (not just me). Though I enjoy the research and factual information or education that non-fiction writing produces, I wanted to know if I could write something for pure entertainment value. To put thoughts to paper. A few years ago I fell in love with the hard case crime series of books. I enjoyed the characters and situations presented by authors such as Lawrence Block, Max Allan Collins, Donald Westlake, Michael Crichton, and Stephen King. Reading these stories, and framing them in my interests and experiences filled my head with story lines and characters. Writing The Unaccounted Four was my first attempt to move these thoughts from my mind to paper. I have 3 books planned through the end of 2017. Two of these will be non-fiction. The third will be fiction, a follow-up book featuring the same Alex Jackson from The Unaccounted Four. Watch for the ‘Whats Next’ tab in the sidebar menu. Upcoming works and writings will be featured on the ‘Whats Next’ page. 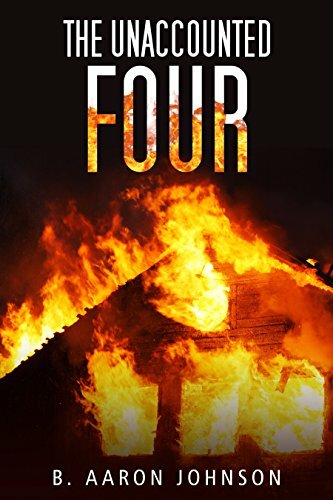 I am happy to announce that The Unaccounted Four is now available on the Nook platform. Here is the complete prologue from, The Unaccounted Four. Heavy fire was already rolling out of the second story windows when the one, and only, fire engine, an open-cab American LaFrance, pulled onto the scene. The fire chief and another volunteer jumped out, slinging on the remaining parts of their firefighting ensemble. At this stage of the fire with the heavy involvement the Chief new instantly that the structure would be a total loss. However, he couldn’t know whether anyone was inside or if the conditions were still even tenable to life. He barked an order to his lone fireman, “Grab a line and extend it to the door, I’ll engage the pump and back you up.” He knew his 750 gallons of water would never be enough to fully extinguish the fire, but he hoped it would be enough to get inside and save anyone he could. As he ran to join his partner on the fire hose, a woman frantically grabbed his arm screaming, “My babies are still in there! Help me, please!” He pulled away and continued toward the house. On the hose line they were able to make entry. Once inside the door, they were met with oppressive heat, that pushed them both to the ground. The smoke inside was thick and dark. There wasn’t much time! As the firemen dragged the hose into the first room, they heard a loud crack, and saw a flash toward the back of the house. It was starting to collapse around them! Quickly, the Chief gave the command to back out. They made it out to the yard just as all the fuels in the house simultaneously ignited and the whole structure flashed over. Now, fully involved, there was nothing anyone could do, but watch. Hours later, the Fire Chief and the Police Chief, were digging through the structure. They were looking for signs of any survivors or bodies. The mother and father had made it out with one child, but there were four that were not accounted for. After days of digging there were no remains found. The children were presumed dead, where else could they have been? They were small, babies, that had been tucked in for the night by their parents. There was no other explanation. They had perished in the fire. It was assumed that the flames had reached such high temperatures that all bones, teeth, and other body parts had been disintegrated. From what the investigation could best determine, the fire had started in the attic. Most likely caused by faulty electrical wiring. The fire had moved rapidly through the ceiling above the children. As they slept, the fire grew. By the time of the first scent of smoke and the first sight of flames, the fire was too large to stop. It progressed rapidly. It was only by luck that the mother, father, and the oldest son had made it out. Here are some other cover designs that were suggested for, The Unaccounted Four. Have you read the book? Do you prefer any of these covers? Subscribe to my newsletter for regular updates, new books, information, and other fun stuff!